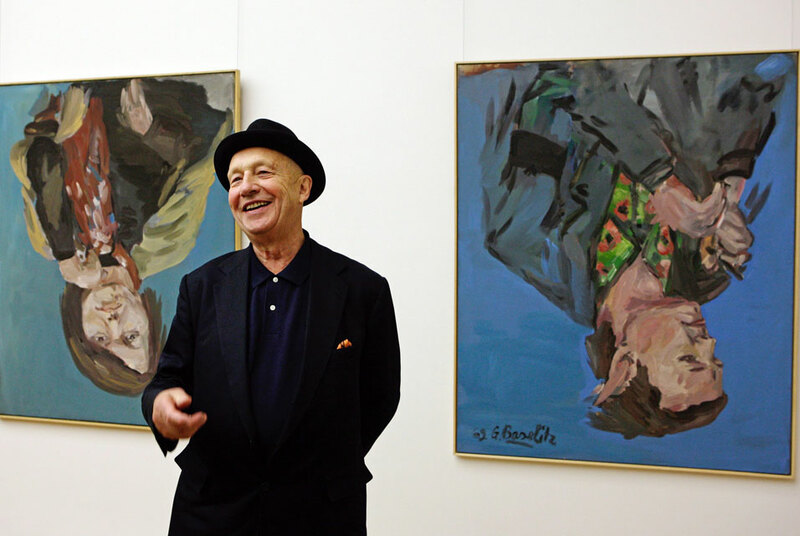 German artist Georg Baselitz smiles in front of his works "Portrait Elke I"(L) and "There. Portrait (Franz Dahlem)" (R) at Albertinum gallery in Dresden, Germany, 26 May 2010. Twelve of Baselitz's most significant works will be displayed in the Gallery New Masters of Albertinum, the Saxony-born artist will be represented by eleven paintings and one wooden sculpture. EPA/OLIVERKILLIG. DRESDEN.- Painter Georg Baselitz will have a separate room in the Galerie Neue Meister in Dresden in the new Albertinum. Twelve works by the artist will be there for visitors to see starting June 2010. In a separate hall between the rooms dedicated to AR Penck and Gerhard Richter, eleven paintings and a wooden sculpture, as specified by the artist, will be set up. Besides some loans, including two works that are owned by the State Art Collections in Dresden, such as "The bridge ghosts supper" from the year 2006, and "women's head and fir" from 1985. "Dresden is a difficult place for me," the 72-year-old artist said on Wednesday at the presentation of the room. "Here I have had very serious and deep experiences." After a thorough restoration and refurbishment, the new Albertinum now presents itself as a centre of art from the Romantic period to the present day. The new concept for the museum was occasioned by the disastrous flooding of the River Elbe and its tributaries in 2002. What began as a catastrophe which also affected the storerooms in the basement of this historic building eventually turned out to be a golden opportunity for the Staatliche Kunstsammlungen Dresden. Three months after the flood, more than 40 contemporary artists raised money by auctioning famous items from among their works. The proceeds of more than 3.4 million Euros gave the initial spark for the complete restoration of the Albertinum, integrating a flood-proof museum structure that is unparalleled anywhere in the world. An architectural competition brought forth a spectacular concept produced by the Berlin firm Staab Architekten. The firms architectural masterpiece consists of a raised structure containing storerooms and restoration workshops as an ark for art. This new structure has created not only a bright inner courtyard with space for a café, bookshop, gallery concerts and theatrical performances but also a second entrance to the museum. From now on, visitors can enter the Albertinum either via the traditional entrance on the Brühlsche Terasse or from Georg-Treu Platz. Thus, the museum has provided Dresden with an additional important public space. The new exhibition halls are shared by the Galerie Neue Meister and the Skulpturensammlung. The holdings of both museums, with paintings ranging from Caspar David Friedrich to Gerhard Richter and sculptures ranging from Rodin to the 21st century, have an outstanding worldwide reputation. Huge glass-fronted display storerooms provide visitors with unprecedented insights into the internal workings of the museum and will open previously hidden works to view on a permanent basis. Within the Staatliche Kunstsammlungen Dresden the new Albertinum constitutes a bridge between the past and the future. Whilst the exhibition rooms provide a large stage for the presentation of modern and contemporary art, paintings by both old and modern masters are simultaneously restored behind the scenes. The new Albertinum as a whole is designed for encounters between painting and sculpture, between the Romantic and the Modern, between East and West and between yesterday, today and tomorrow.